Ringo is descended from a family of games including Fox & Geese, Fidchell, and Hnefatafl. They are all based on battles between unequal forces. The smaller army is given an advantage in movement to make up for it's smaller size. 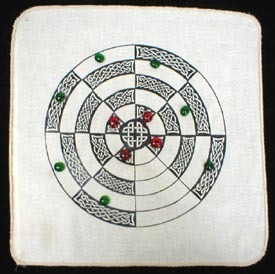 We affectionately call Ringo an "evil little game" because the circular board and a "neutral zone" add intriguing twists.